Tennessee and Iowa now know when they’ll be tipping off when they play each other in the second round of the NCAA Tournament on Sunday. After the conclusion of the final game of the NCAA Tournament on Friday night, the NCAA announced tip-off times for all the Sunday slate of games in the second round, and Brian Hamilton of The Athletic shared the information. The No. 2 seed Vols (30-5) and No. 10 seed Hawkeyes (23-11) will tip-off at 12:10 PM Eastern on CBS as they face-off for a chance to advance to the Sweet Sixteen. These two teams have recently played each other in the NCAA Tournament. 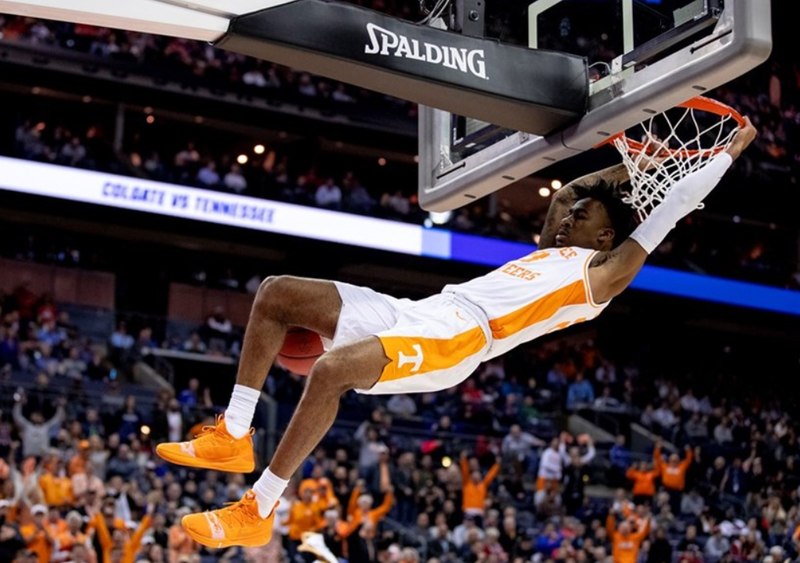 The two squads were matched up in one of the “First Four” play-in games of the 2014 tournament, and the Vols used a furious rally in the second half to tie up the game and eventually defeat the Hawkeyes 78-65 in overtime. This year, the two teams will be playing to be one of the last 16 teams in the tournament. How did the two teams get here? Iowa pulled off a 79-72 upset over No. 7 seed Cincinnati in their first round match-up while the Vols survived No. 15 seed Colgate’s upset bid themselves, prevailing 77-70. The Hawkeyes nailed 11 of their 22 three-pointers against the Bearcats to get by the first round. Iowa trailed 18-5 early in the first half, and they trailed by 12 before going on a spurt just before halftime. Cincinnati led by a score of 36-31 at the break. But the Hawkeyes’ offense came alive in the second half, as they scored 48 points against a typically stingy Bearcats defense. Iowa shot over 65 percent from the field in the second half and were led by Luka Garza’s 20 points and seven rebounds. The Hawkeyes overcame their rough start for the victory. Tennessee started out strong against Colgate, racing out to a 9-0 lead and holding an 11-2 edge before the Raiders went on a quick 6-0 run. But the Vols would get a 16-point lead with under three minutes to go in the first half, and they held a 42-30 lead at halftime. In the second half, the Raiders caught fire from three and ended up erasing that halftime deficit. Colgate grabbed a 52-50 lead with 11:35 to go, but then UT settled down and weathered that storm. Tennessee used a couple clutch threes from Admiral Schofield to survive Colgate’s Jordan Burns’ hot night from three. Burns dropped 32 points on Tennessee, but the rest of the Raiders’ team managed just 38 points combined. The Vols and Hawkeyes have split the four games they’ve played previously in men’s basketball. Tennessee has won two-straight games against Iowa after the Hawkeyes won the first two meetings between the two schools. Iowa won 64-59 in Los Angeles in December of 1967 and then defeated the Vols by a score of 92-86 in Las Vegas in December of 1977. Tennessee took down the Hawkeyes 80-68 in Honolulu in December of 2000 and then again by a score of 78-65 in overtime in the play-in game of the 2014 NCAA Tournament.